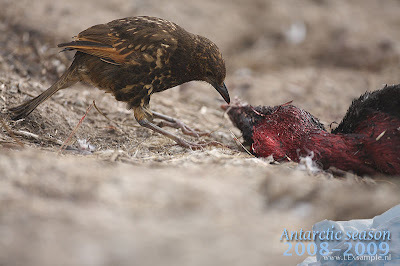 The Tristan thrush or Starchy, Turdus eremita, an endemic bird of the remote Tristan da Cunha group of islands in the South Atlantic, scavenging on a dead penguin (starchies have decidedly more catholic tastes than other thrushes). Photo by Lex. 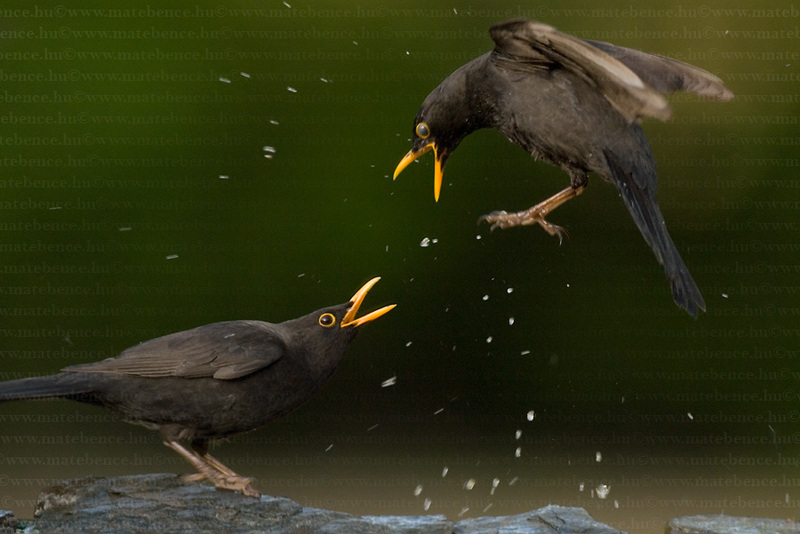 Turdus, the thrushes, is a large cosmopolitan genus of birds found throughout the world except for Australia. The extent of the genus' circumscription has varied between authorities, though most recent authors exclude the ground-thrushes of the genus Zoothera. Conversely, phylogenetic studies have indicated that the previously monotypic genera Cichlherminia lherminieri of the Caribbean and Nesocichla eremita from Tristan da Cunha should be subsumed within Turdus (Voelker et al., 2007). At present, it seems unlikely that Turdus will be further subdivided; as the basalmost species in the genus is likely to be the mistle thrush Turdus viscivorus, which happens to also be the type of the genus, any subdivision would require that Turdus be reduced to a single species and all other species placed in new genera. The blackbird Turdus merula, a species found throughout northern Eurasia (and introduced to New Zealand). Only the males are black; the females are dark mottled brown and have grey rather than yellow beaks. Photo by Bence Mate. Of the 60+ species remaining in Turdus, many are widespread and divided into a number of subspecies that may or may not be promoted to separate species by future researchers. As an extreme example, a study on variation between geographically separated populations of the island thrush Turdus poliocephalus, whose distribution extends from Sumatra and the Philippines east to Norfolk Island* and Vanuatu, suggested that there may be grounds for dividing them between nearly forty diagnostic taxonomic units (Peterson, 2007). *At least, it did. 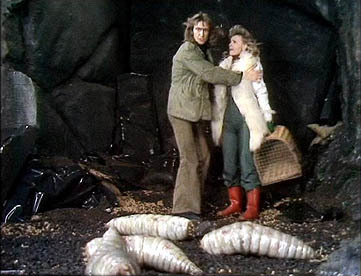 The Tasman Sea populations of T. poliocephalus have, unfortunately, since shuffled off this mortal coil. The St Lucia forest thrush, Turdus lherminieri sanctaeluciae. Like T. eremita, this is a distinctive species that was previously placed in its own genus. Photo by Jean-Michel Fenerole. The base coloration of most species of Turdus can be described as 'mottled brown', though notable exceptions (at least as males) include the grey and red American robin T. migratorius and the blackbird T. merula. Most members of the genus are more highly regarded for their voices rather than their looks, an attribute honoured in both the vernacular and scientific names of the song thrush Turdus philomelos* ("lover of song"). As with other speciose songbird clades, variation in song has turned out to be significant in separating closely related species. Both the Príncipe thrush T. xanthorhynchus (Melo et al., 2010) and the black-throated thrush T. atrogularis (Sangster et al., 2009) differ in their songs (among other things) from species with which they were previously considered conspecific. *Older references may one of the names Turdus musicus or Turdus ericetorum for this species. Both these names have since been suppressed by the ICZN. The history of Turdus musicus is particularly turgid, as authorities had disagreed over whether the name should be applied to the song thrush or to the redwing (now Turdus iliacus) (Mayr & Vaurie, 1957). Both T. musicus and T. iliacus appeared in Linnaeus' 1758 Systema Naturae. Unfortunately (whether because he was unclear on the distinction between the species, or by a simple composition error), Linnaeus confused the two species' descriptions: under T. musicus, he gave a description of the redwing but provided sources referring to the song thrush, while the entry for T. iliacus attached a description of the song thrush to references referring to the redwing! (The significance of Linnaeus' sources to his descriptions has previously been discussed in the sperm whale nomenclature post.) Mayr & Vaurie's (1957) application buried the name Turdus musicus and designated a neotype to fix Turdus iliacus firmly to the redwing. Mayr, E., & C. Vaurie. 1957. Proposed use of the plenary powers to suppress the specific name "musicus" Linnaeus, 1758, as published in the combination "Turdus musicus" and to approve a neotype for "Turdus iliacus" Linnaeus, 1758, the Eurasian redwing (class Aves). Bulletin of Zoological Nomenclature 13 (6): 177-181. Melo, M., R. C. K. Bowie, G. Voelker, M. Dallimer, N. J. Collar & P. J. Jones. 2010. 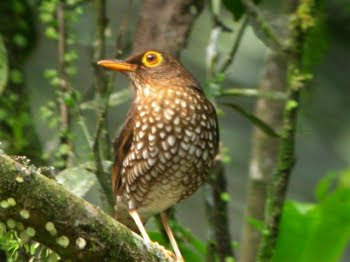 Multiple lines of evidence support the recognition of a very rare bird species: the Príncipe thrush. Journal of Zoology 282 (2): 120-129. 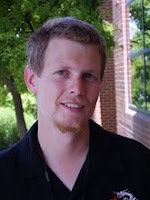 Peterson, A. T. 2007. Geographic variation in size and coloration in the Turdus poliocephalus complex: a first review of species limits. Scientific Papers, Natural History Museum, The University of Kansas 40: 1-17. Sangster, G., A. B. van den Berg, A. J. van Loon & C. S. Roselaar. 2009. Dutch avifaunal list: taxonomic changes in 2004–2008. Ardea 97 (3): 373–381. Voelker, G., S. Rohwer, R. C. K. Bowie & D. C. Outlaw. 2007. Molecular systematics of a speciose, cosmopolitan songbird genus: defining the limits of, and relationships among, the Turdus thrushes. Molecular Phylogenetics and Evolution 42: 422-434. And in the New World, the blackbirds are Icterids, but the term is also used to describe Ravens and Crows and even European Starlings.